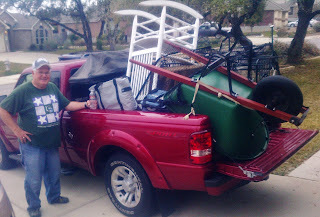 Last spring we made the decision to sell our home in Helotes and move to the Katy area to be nearer family. Packing, storing, showcasing, and repairing the house occupied most of our time. It all paid off and we closed on the property a few weeks ago and moved to the Sealy-Katy area while awaiting the completion of our new home. Writing took a back seat to all this work, but bits and pieces of plot and character development would come to me in that wakening stage in the early morning hours and I have gathered quiet a bit of info. Now we are somewhat settled and I can get back to the next book. Need help obtaining a copy of one of my novels, or have feedback? Copyright © Les Coalson. Picture Window theme. Theme images by sndrk. Powered by Blogger.